In the tales told in Terrinoth, there is a legendary land, a place long lost. Many have attempted to find it once more, but like a mirage in the desert, it has forever eluded them, remaining tantalizingly on the horizon. It is a harsh place of blowing sands and dangerous creatures, of beautiful cities and alien magics. It is the land of Al-Kalim! In this expansion to the Runebound fantasy adventure board game, the players have found the key to this hidden place. Their goal is to forge their own entry in the Ninety-Nine Tales of Al-Kalim. Sands of Al-Kalim differs from most Runebound adventures in that it does not include Encounter and Event cards that describe a set story. Rather, the players tell the story! They will face legendary challenges and gain legendary rewards, including mighty mounts, forgotten runes, and magical artifacts. He who completes his tale first is immortalized in song and legend, and wins the game. 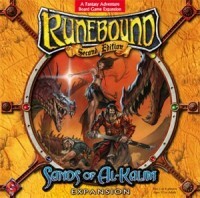 Add a Review for "Runebound: Sands of Al-Kalim"